What is your relationship to your own creativity? Are you nurturing that inner creative voice, or is it sitting somewhere on a back burner, minimized or even forgotten? In your busy life, it can be a challenge to prioritize your creativity. Your creativity is your birth-right, something you were born with, something we all have. When you nurture it, your life is richer, fuller, and more balanced. Our Creative Life Enrichment Program offers a wide range of arts and expressive arts opportunities. You may enroll in a single class, a series, an intensive, or even participate virtually. We have designed our programs to be flexible and varied, to meet your needs and match your interests. All our offerings uphold the belief that we are all creative beings. We can each embrace our artist-self and reap the benefits of our unique creative wisdom. Our approach is free of judgement, critique, or interpretation. We hold the space and guide you with care, support, and acceptance. Immerse yourself in creative process and time may stand still, your heart rate slows, and you breathe more deeply. You experience greater self-awareness, relaxation, mindfulness, presence, balance, personal growth, joy, authenticity and healing. Even a short time makes a big difference in your day. An ongoing practice makes a huge difference in your life. “What if I am not an artist?” you may ask. We hear this question a lot! The belief -“I am not an artist” – is a learned belief. Having been learned, it can be unlearned.Early life experiences and a culture that views the arts as the property of only the talented and trained may have led you to consider yourself as “not an artist” or even “not creative”. Re-connecting with your creative wisdom in a nurturing, accepting atmosphere will help you form a new belief about yourself, and begin to reap the benefits of a creative practice. We recognize that signing up for an “art class” can be a scary thing. We open our doors to you, so that you may restore a positive relationship with your creativity and value it as a source of wisdom, pleasure, and balance. Maybe you have always been an artist, but you need a “jump start”. 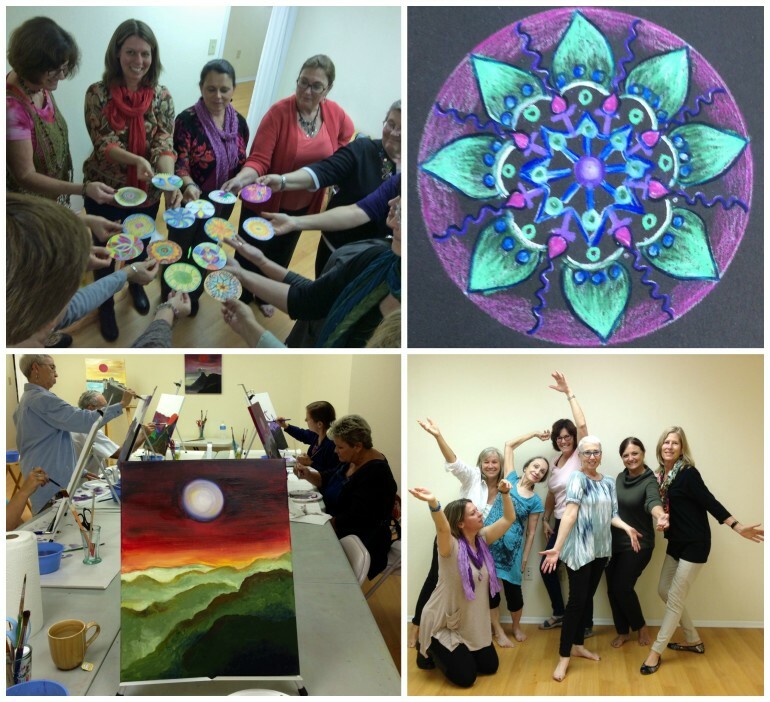 Creative Life Enrichment workshops and classes are an ideal way to re-connect with inner vision and your authentic creative voice, in a gentle, exploratory, and playful way. Choose between a variety of options such as Touch Drawing, Bookmaking, Art as a Healing Practice, Mandala Club, Adult Art Camp, Painting Your Creative Edge, Dive-in weekend intensive, and more as part of our Creative Life Enrichment Program. Check our upcoming workshops here, and sign up for our e-news here. And, if you decide that you want to participate in our certificate training program you can earn credit which may be applied. Contact us at institute@expressiveartsflorida.com for details and go here to see course offerings.